Home > Share - ETFs > Bharat 22 ETF - Why should you invest? Bharat 22 ETF – Taking part in India’s growth story! On August 04, 2017, the Honorable Finance Minister, Mr. Arun Jaitley announced the launch of Bharat 22 ETF. This announcement was in line with the Budget Speech of 2017-18, wherein the Finance Minister had promised to use ETF as a vehicle for further disinvestment of shares. Now that there is a variety of ETFs already existing in the markets, what is important to note is how this newly launched ETF different from the existing one. Moreover, the highlight of this ETF is the unique combination of the 22 names of Central Public Sector Enterprises (CPSEs), Public Sector Banks (PSB) & strategic holdings of SUUTI. Thee names are spread across six sectors namely Basic Materials, Energy, Finance, FMCG, Industrials and Utilities. This ensures that the underlying index blends sectors with secular growth prospects (FMCG and utilities), and cyclicals (energy, metals, industrials). This composition is in stark contrast to the previous tranches of CPSE ETFs wherein nearly 85% of the portfolio consisted mainly of Energy followed by Metals and Financial Services. As a means to improvise on this past scheme of arrangement, a sector level cap of 20% and a stock level cap of 15% has been implemented in Bharat 22 ETF. Take part in India’s growth story..! Most of the stocks in the Bharat 22 portfolio have played a major role in building India’s foundation and its economic growth. 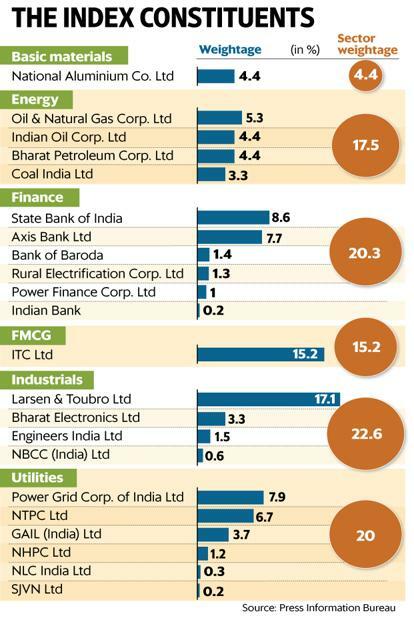 Stocks like Larsen & Toubro have the highest weightage at 17%, followed by ITC at 15.2%, SBI at 8.6%, Power Grid Corporation at 7.9% and Axis Bank at 7.7%. According to the finance minister, the sectors have been selected keeping in mind the sectoral reforms in each of them, which have had direct impact on the valuations of the stocks. The Bharat 22 ETF is not restricted to any particular sector of theme. Majority of the portfolio, almost 90%, in the Bharat 22 index is invested into large-cap stocks, which brings stability and lower volatility to the portfolio. The ETF also gives investors the chance to get incremental returns by investing into some high quality mid-caps and small-cap stocks, which form 8% and 2% of the portfolio, respectively. Just so that the portfolio is well diversified, the Bharat 22 index has capped the weightage of each stock to 15% and the sectoral exposure limit is set at 20% to avoid undue over-exposure. Although ETF are mutual funds, they are more liquid in nature as they are traded on the stock exchange. Investors can easilybuy and sell units of the Bharat 22 ETF on the stock exchange on a real time basis; the value of the ETF unit will rise or fall in line with the value of the 22 underlying stocks. Since the stocks that the Bharat 22 will invest into are extremely liquid, it is expected to bring a large investor base, which will also reduce transaction cost. Anyway ETF’s bear a lower expense ratio i.e. about 0.5% - 1% since they are passively managed, this will add to your corpus in the long run. Although the Bharat 22 ETF is new,back tested returns show that this index has not only outperformed the BSE Sensex but also some of the best performing large cap funds. Since March 2006 (last 10 years), the Bharat 22 Index delivered a return of 12.9 %, while the Sensex returned 9.2%. During this period your investment amount of Rs 1 lakh would have grown to Rs 3.4 lakhs with Bharat 22 ETF and Rs 2.4 lakhs only in the BSE Sensex. The dividend yield offered by the Bharat 22 Index was also higher at 2% (FY 2016-17) compared to 1.3% offered by the BSE Sensex, which will adds to your overall returns. The government’s earlier offering of the CPSE ETF has also returned handsomely to the investors, delivering 17.5% over the last one year and has been successfully raising money from investors with an asset base of about Rs 5800 cr. They have also managed to curtail the expense ratio of the fund at 0.07% only compared to 2% charged by most equity mutual funds. There are high chances that the government may offer a discount to market price for the Bharat 22 ETF. This fund is best suited for you if you want to take part in the India growth story by investing across a good blend of public and private sector companies. The companies which form part of the Bharat 22 indexare largely leaders in their respective categories with robust fundamentals. Given that the ETF will have one of the lowest expense ratios in the industry; this ETF provides a cheap and easy way to access the India growth story. One can easily consider the Bharat 22 ETF to be a part of one’s core portfolio for meeting long termfinancial goals.